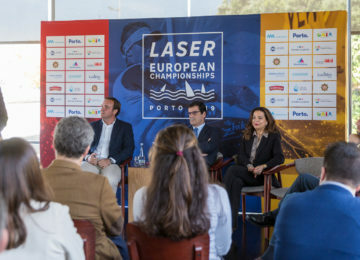 The 2018 Laser Master European championships concluded today in Vigo, Spain. 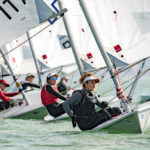 After 5 days of races with most of times tricky winds, our Laser Master sailors could enjoy of a nice week with warm weather, plenty of sun, fun and camaraderie. 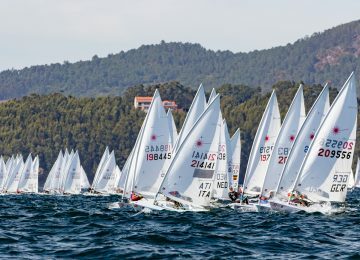 Sailors were sent earlier to courses this morning with a nice wind and aiming to make 3 final races, but after a short and strong rain the wind completely disappeared. Finally close to the 15:00 last warning signal the wind showed up again, allowing one last race to be added to scores. 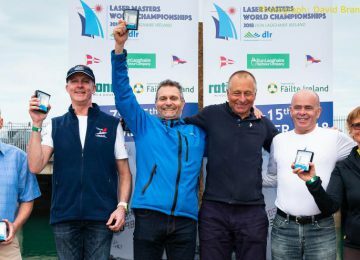 First spot overall among the Laser Standard fleet was finally for Grand Master sailor Alan Davis GBR (3-4-1-8-23-2-1) with 19 points. Second overall was overnight leader Jordi Capella ESP (9-1-2-1-2-9-17), scoring his worst race today due to a penalty, but still crowned Apprentice Master’s champion with 24. Third place overall and Master’s championship for German sailor Roger Schulz GER (4-5-15-15-8-3-31) with 50 units. Australian sailor Mark Bethwaite AUS (18-9-11-4-33-8) was first among the Great Grand Master’s and 4th overall. Second Great Grand Master’s place was finally for British sailor Michael Hicks GBR (33-16-8-10-15-57-8) on 12th. 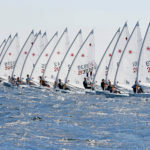 Jon Emmett GBR (1-1-1-18-1-2) was the overall winner among the Laser Radial fleet and also Apprentice’s champion with 6 points. 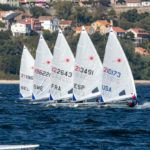 Second place overall for the new Master’s champion Ian Jones GBR (2-2-7-3-2-5) with 14. Third place overall for Master’s vice champion Alessio Marinelli ITA (3-4-2-5-2-DSQ70-12) with 26 units. 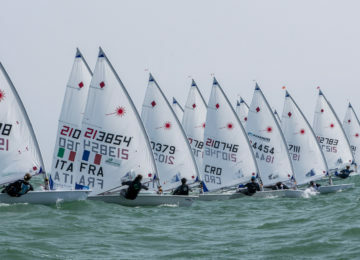 French sailor Pierrick Amizet FRA (8-19-5-7-5-3) was finally the European champion among the Grand Masters, ranked 4th overall with 28 points. Monica Azon ESP (22-13-4-4-12-1) ratified women’s leadership winning the last race and finishing 6th overall with 34 units. Jean Philippe Galle FRA (13-16-22-6-14-19) conquered the Great Grand Master’s championship finishing 12th overall with 68. 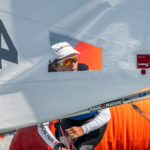 French sailor Jacky Nebrel FRA (20-30-19-33-15-DNC) was crowned 2018 Legend European champion, concluding event on place 23rd among 69 participants. We want to thank you all Master sailors for such an awesome sailing week. 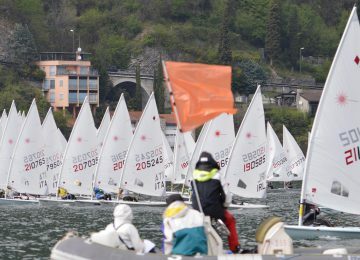 Hope to see you next year in Roses for the 2019 Laser Master European championships! 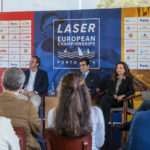 Remember you can review all the Laser Master’s European action on our Facebook, Twitter, Instagram and YouTube accounts. By Agustín Argüelles – EurILCA | Photos: Thom Touw photography.